Locks 2 and 3 of the Ohio and Erie Canal were built just to the north of Clinton, linking this small village and its rich natural resources to the rest of the state. Clinton’s economy and growth was fueled by the ability to ship large quantities of products to farther markets via the canal. In addition, the time it took to get boats through the locks created an opportunity for commerce and Clinton became an important local shipping point. Clinton became a center for wheat and coal shipment. After the establishment of the canal, farmers transformed from subsistence operations to large scale production. During one decade of the canal era, Clinton’s grain merchants purchased more grain than was purchased in Akron. Coal came to Clinton via the Messenger Canal, a small feeder canal that connected with the Ohio and Erie Canal at Clinton and provided access to the coal mines of nearby Rouge’s Hollow. Several coal distributors in Cleveland advertised the quality of their coal which came from the “celebrated mines” of Clinton. 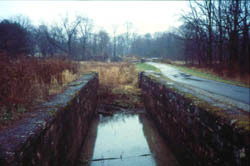 The historic district contains the ruins of the two locks, wasteways, a guard lock dam and four intact segments of the original canal prism. Foundation stones of a lock tender’s house have also been excavated and remain exposed. The Clinton area was the first section of the canal south of a dam built to harness large volumes of water from several river tributaries. The slack water pool of the dam provided an important water source for the Ohio and Erie Canal between Clinton and Massillon. Locks 2 and 3 facilitated the flow of water from the river to the canal--serving as a type of water control valve for canal water levels. This special function may explain why the two locks were located so close together. 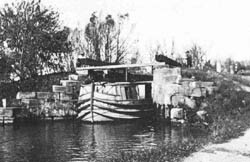 Both of the locks and the guard lock contained flood gates and waste weirs that allowed excess water to pass around the locks during periods of slow boat traffic. The Clinton Ohio and Erie Canal Historic District is located along the canal channel parallel to Water St. in Clinton. A section of the Towpath Trail, a Class I Hike and Bike Path trail runs along side the remaining prism and canal structures. The path features interpretive wayside exhibits that celebrate the history of the canal and its impact on the development of Ohio. Parking for the trailhead is available at 2749 North Street, Clinton. For more information visit the Metro Parks website.